Yesterday at our village vide grenier (car boot/yard sale) I found this super lid for a bargain price of 1€. As well as being an object of beauty that would bring joy to any kitchen it has it's practical uses too as I have discovered by doing a bit of research this morning. It is made by German company Borner (although it no longer appears on their website), is called the Kitchen Joy and is a clever mix of splatter guard and vented see-through lid. The vent allows steam to escape while keeping heat in and the shape of the glass, combined with the metal base ring that collects the condensation, enables a crispy finish for meat and fish and all without splattering the hob top. 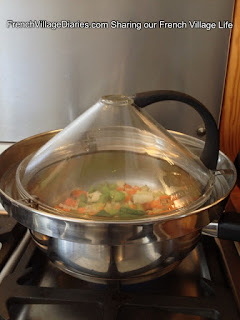 The base ring is also cleverly shaped to enable it to sit safely on different pan sizes and it fits at least two of my favourite frying pans. I can see this being used regularly especially as next month my parents will be visiting and while Dad is great in the kitchen it would be fair to say he can be a little messy too, so this should enable him to cook mess-free, at least while he is here! Thanks to Google and these guys for the information.